Yippee! On Christmas day I received a garden related item. My brother brought over a boxed Amaryllis bulb - Minerva from Israel. It's a beautiful variety. When my youngest gnome was a small boy, he could count on his uncle bringing him one of these science/garden projects on his birthday just 8 days after Christmas. Each year we would open the box, remove the contents, and follow the instructions. Every time there would be a giant flower or two to enjoy. So, today I opened the box and carefully removed the contents to begin the potting/growing process. Yikes! This thing was more like Medusa trying to work its way out of the box. My brother and I are well acquainted with scoliosis; so this specimen was meant to be. At first, I thought I would let nature take its course; but I just couldn't. Like a Milwaukee brace or hardware on Forrest Gump's legs, I had to provide some sort of help to right the abuse this bulb had endured. A bent wire coat hanger graced with a hummingbird ornament will help to slowly straighten this gal right up. In a few more days, her color and posture should improve. I'll post progress here. 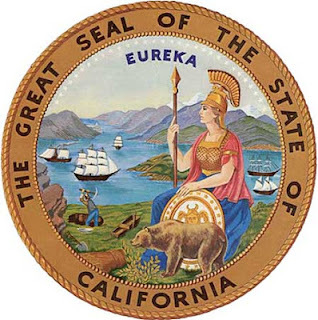 I bet I'm not the only one that has one of these. 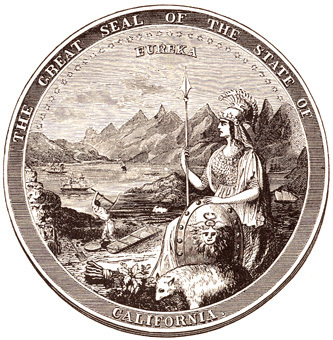 Did you know that is Minerva on the State of California Seal? Well now you do. Interesting. I can't wait to see the progress. I'm sure with your care the flowers will be stunning, even if the stem is a little lopsided!